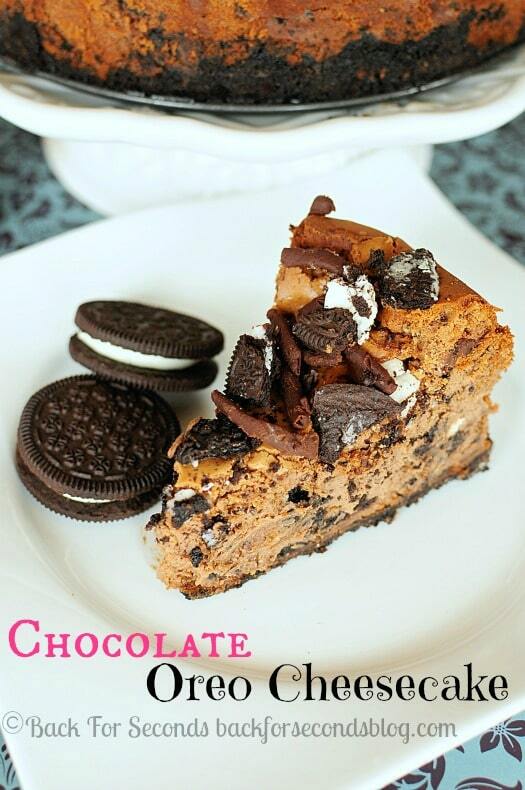 Three kinds of chocolate unite in one deliciously decadent dessert: Chocolate Oreo Cheesecake! 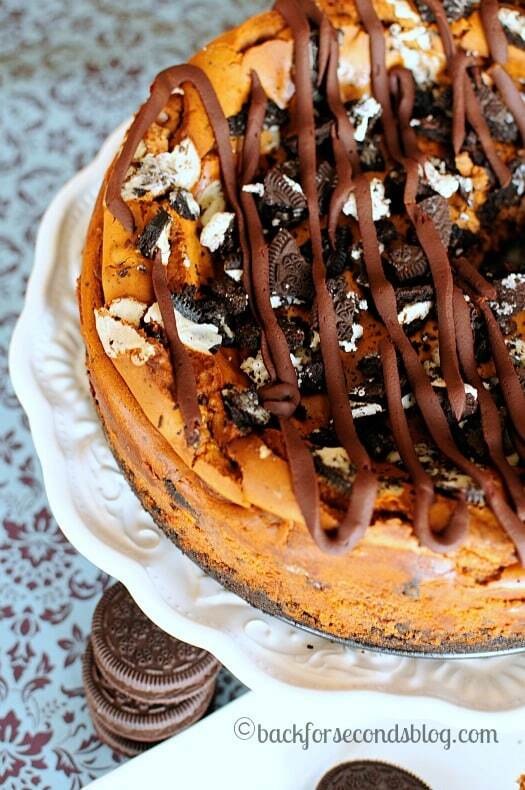 All of my fellow chocoholics out there are going to love this cheesecake! It is loaded with chocolate in every layer. This is one my very first cheesecake recipes and it gets requested over and over again – it’s not hard to see why! This decadent dessert starts with an Oreo cookies crust. Then a rich chocolate cheesecake swirled with Oreo cookies is piled high on top of that. Then even more Oreos are sprinkled over the top. And lastly, a generous drizzle of chocolate ganache to finish it off. Just try saying no to a slice (or two)! When I meet you, I absolutely insist we eat an entire one of these to ourselves because OMG, it is to-die for! You are killing me with this one! 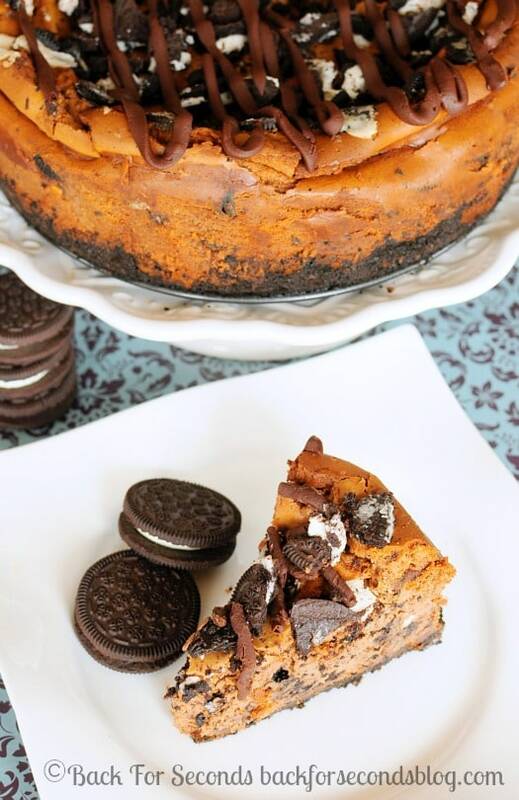 Oreo’s are my weakness, how could I possible refuse a slice (or two) of this cheesecake? What a delicious cheesecake, Stephanie! I definitely wish I could have tried this at a real shower for Lisa instead of our virtual one….but all the more reason to make it myself! Pinning! Oh, you really know how to tempt a girl! This looks sinfully awesome. Can’t wait to try it out for my next gathering. Thanks for sharing on Busy Monday.